A volcano erupted in Indonesia early Sunday, causing thousands of people to flee their homes, officials said. There are no reports of casualties or injuries so far. 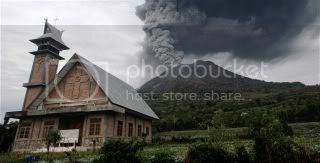 Mount Sinabung in North Sumatra had been inactive for more than 400 years. It had been classified as inactive by the Center for Volcanology and Geological Disaster Mitigation. BB surely another indicator that the planet is in the throes of change and getting ready to release energy on a mass scale. This one does not seem to be linked to a direct action from the sun as in flares or particular sun spots. But as has been written, the sun is doing a lot as a source of energy (amongst other influences from the area of our galaxy we find our self in and the galactic centre) to build up energy in the core of the planet which is going to be released in the future as a torque release within the mantle. Lets hope the surveyors of this event are correct in what they say. On Saturday, the Center for Volcanology and Geological Disaster Mitigation issued a warning and ordered evacuation of a 6 km (3.7 miles) radius around the volcano. Surano said investigators are monitoring and studying the volcano. Based on the data they have now, he said, a large, destructive eruption is unlikely. Yep, Sky, sadly I think you are correct. See below - it blew again. Jakarta, Indonesia (CNN) -- Two people have died and more than 30,000 were displaced when a long-dormant volcano in Indonesia erupted again on Monday, officials said. Mount Sinabung, which had been dormant for more than 400 years before it erupted early Sunday, erupted again for more than six hours Monday, shooting smoke more than three miles into the air. The rumbling sent tremors into nearby villages, where officials said some residents panicked. "It has now stopped. We have enough food and water here, but we need more gas masks," said Johnson Tarigan, a spokesman for Karo district. "The two people died because of heart attack and respiratory complication," said Priyadi Kardono of the National Disaster Coordination Agency. "We have sent food and gas masks for the rest of the displaced people." What a sense of dread I develpoed just thinking what the folk around that region must have felt when the volcano blew her top. It must be an awful experience to go through. I am grateful that I live in an area that has no such faults or sleeping volcanoes. A prayer for their well being in the coming days will be in order I'd say. Homes abandoned, crops destroyed. Poor, poor people! "Regarding the danger of the Sinabung volcano, eruption of just volcanic ash and not lava flow, not much glowing material, it is not very dangerous for the life," he said. Surono says he plans to lift the evacuation order in a week or two if the situation does not change. But there were reports on Tuesday some villagers have already returned to their homes. Thousands of people have been treated for smoke inhalation and other health problems related to the volcano. The Indonesian Red Cross and the Health Ministry sent doctors and medicines to the region. The National Disaster Management Agency is providing thousands of face masks and food to assist the evacuees. The 2,400-meter-high volcano last erupted in the year 1600, and officials say they had not been monitoring the mountain because it had been inactive for so long. TANAH KARO, Indonesia — An Indonesian volcano shot black ash three miles (5,000 meters) into the air early Tuesday — its most powerful eruption since springing back to life after four centuries of dormancy. The force of Mount Sinabung's explosion could be felt five miles (eight kilometers) away. "This one was really terrifying," said Anissa Siregar, 30, as she and her two sleepy children arrived by truck at an emergency shelter near the base, adding that the whole mountain shook violently for at least three minutes. "It just keeps getting worse." Again, I am glad we don't live near the ring of fire!